After a series of delays beginning with a coolant pump failure which prompted a Christmas Eve spacewalk, a blast of Arctic air which chilled much of the nation, and finally high radiation levels in space, Orbital Sciences is ready to conduct its second flight to the International Space Station, and the first of eight scheduled under NASA’s Commercial Resupply Contract. 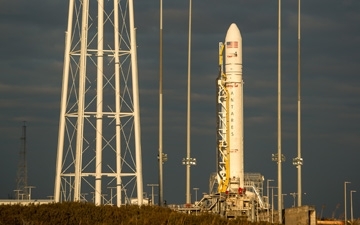 With a planned liftoff at 1:07 p.m. EST from Pad-OA at the Mid Atlantic Regional Spaceport (MARS), the medium class Antares booster is carrying a Cygnus cargo vessel loaded with 1465 kg of supplies, including its first powered payload. If all goes according to plan, Cygnus will be berthed to ISS on Day 3 of the planned 46 day mission. • NLP Vaccine-21 (Antibiotic Effectiveness in Space – 1) – Is aimed at using a spaceflight antibiotic effectiveness model to help address drug-resistance issues on Earth. Specifically, this study is designed to identify what phenotypic and transcriptomic changes permit bacterial survival under normally inhibitory concentrations of antibiotics. • BCAT-KP (Binary Colloidal Alloy Test – Kinetics Platform) – Focuses on a fundamental understanding of the underlying physics that will enable formulation of commercial products with enhanced performance and stability. • BASS-2 (Burning and Suppression of Solids 2) – Studies how the unique space environment affects a material’s burning behavior, yielding results used in combustion models and predictions with implications to firefighting strategies in spacecraft and performance-based material selection. • NanoRacks Module 9 S/N 1008, 1010, & 1011 – Consist of suites of student spaceflight experiments in areas such as enzyme activity in microgravity, DNA mutation rate, cell regeneration, and oil bubble formation. • NanoRacks Module 38 (NanoRacks Mission Discovery ISS Biomedical Experiments) – Examines petri dish growth utilizing the NanoRacks Microscopes Facility. • Commercial Generic Bioprocessing Apparatus Science Insert – 06: Ants in Space (CSI-06) compares behavior differences in groups of ants living in normal gravity and microgravity conditions. It measures how the interactions among ants in a group depend on the number of ants in a given area. • Story Time from Space – Consists of crewmembers videotaping themselves reading children’s books, and completing simple demonstrations that accompany the science, technology, engineering, and math concepts in the books. SPHERES-Slosh (Synchronized Position, Hold, Engage, Reorient, Experimental Satellites – Slosh) – Uses small robotic satellites on the ISS to examine how liquids move inside containers in microgravity. • NanoRacks CubeSat Deployers (NRCSDs) & CubeSats – Involves economical small satellite launching platforms and multiple CubeSat-based investigations (Dove (28), ArduSat-2, LituanicaSat-1, SkyCube, UAPSat-1, and LitSat-1).